Detroit has weathered several economic shocks over recent decades, creating a complicated landscape for the financial health of its residents and the city as a whole. For much of the 20th century, Detroit’s strong manufacturing job market fueled a thriving middle class for white and black families alike. Manufacturing moved out of Rust Belt cities over time, and Detroit experienced particularly significant population declines and job losses (Mallach and Brachman 2013). Declines in income and property tax revenue followed, and in the mid-2000s city leaders turned to risky debt financing deals to bridge funding shortfalls (Turbeville 2013). Meanwhile, subprime lending pervaded Detroit, leading to increased distress and default for many homeowners (HUD and Treasury 2013). Consequently, the city and its residents were in a precarious position before the Great Recession, which created further financial troubles. With the culmination of population loss, unemployment, declines in property value from the subprime-lending and foreclosure crisis, and debt obligations, Detroit declared bankruptcy in 2013 (Turbeville 2013). The city lost revenue, residents experienced disruptions in services, and more homeowners went into foreclosure and lost equity. Detroit’s subsequent economic recovery has been uneven: home equity values have been on the rise and foreclosures have fallen close to precrisis levels, but mortgage credit remains extremely scarce (Bai et al. 2016). Similarly, job losses have stabilized, but Detroit’s unemployment rate remains highest among the 50 largest cities in the United States.1 Yet, with renewed investment and more-stable households, the financial future of Detroit is hopeful. Because financially healthy households can better contribute to the local economy, Detroit’s economic health is intertwined with that of its residents (McKernan et al. 2016). Understanding the financial health of residents can help the city design and promote more effective policies, programs, and products. Measures of family financial health capture how a family balances financial resilience and security in the near term with the ability to plan and pursue opportunities in the longer term (CFPB 2015; Parker et al. 2016). Elements of family financial health include being able to pay bills on time, maintaining a sustainable debt level, and having a prime credit score. Local efforts to improve family economic well-being have also focused on lowering debt levels and improving credit scores (Theodos et al. 2015). Credit scores are an important element of financial health; good credit scores can expand access to credit and determine the cost of borrowing. We use individual-level credit bureau data provided by Experian® from August 2015 to examine elements of Detroit residents’ financial health (i.e., credit scores, access to credit, credit health, and ability to pay debt on time). We focus on the City of Detroit and provide information for the Detroit metropolitan statistical area (or MSA, which does not include the City of Detroit), 11 other Rust Belt cities with populations over 200,000 (Buffalo, Chicago, Cincinnati, Cleveland, Columbus, Fort Wayne, Indianapolis, Milwaukee, Pittsburgh, Rochester, and Toledo), and the United States. Credit bureau data offer insights into how Detroit’s residents are doing following the subprime lending and foreclosure crisis as they move into a new chapter of recovery. The credit bureau data show that Detroit residents can continue to improve their financial health in various ways that could have lasting, positive impacts on the local economy. Lenders use credit scores to make decisions about most consumer loans, including mortgages, auto loans, credit cards, and private student loans (CFPB 2012b). Consumers with no or low credit scores are considered risky and may not be offered loans or may only be able to access loans with high interest rates and poor terms. A higher credit score, or prime score, often means access to lower interest rates on loans and better borrowing terms than those offered to consumers with subprime scores; these differences can save borrowers thousands of dollars over the course of repayment (CFPB 2012b). Twenty-one percent of Detroit residents have a prime credit score, compared with the national average of 55 percent.2 Nearly two-thirds (66 percent) of Detroit residents have a subprime credit score or no score (figure 1). Subprime consumers differ from those with no score; consumers with no credit score (4 percent of Detroit residents) tend to have had little interaction with traditional credit, while most consumers with a subprime score (62 percent of Detroit residents) have been unsuccessful with credit. Only 1 percent of Detroit residents with no credit scores have an open trade line, such as a credit card or mortgage, compared with almost 40 percent of Detroit residents with subprime scores. However, Detroit residents with subprime scores are much more likely to have delinquent debt than those with no scores (90 percent versus 31 percent). 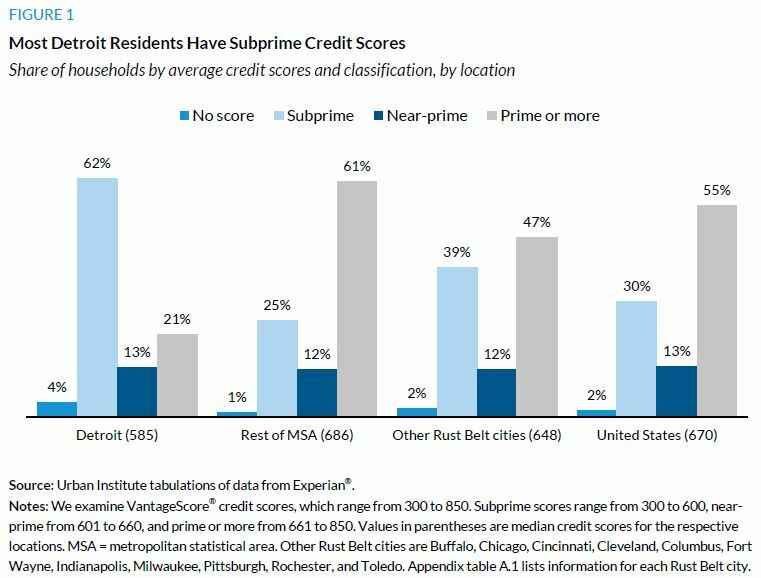 The median (552) and average (585) Detroit resident credit scores are in the subprime range of 300 to 600. Using credit score as an indicator of financial health, Detroit residents have further to go on the path to financial health than residents from other Rust Belt cities. Thirty-nine percent of residents in Rust Belt cities have a subprime score compared with 62 percent of Detroit residents. Consumers access credit with each swipe of a credit card. Credit cards and other types of revolving credit such as personal lines of credit provide important access to credit for many consumers.3 This type of credit is not universal. For some Americans, living without credit is a choice; for others, credit is unavailable. Over 20 percent of credit applicants are rejected, and 6 percent of US consumers report needing credit but being too discouraged to apply.4 These consumers often have subprime credit scores. We proxy for consumers’ access to credit by identifying whether they have traditional revolving credit (e.g., a credit card) and whether they have vehicle or mortgage debt. 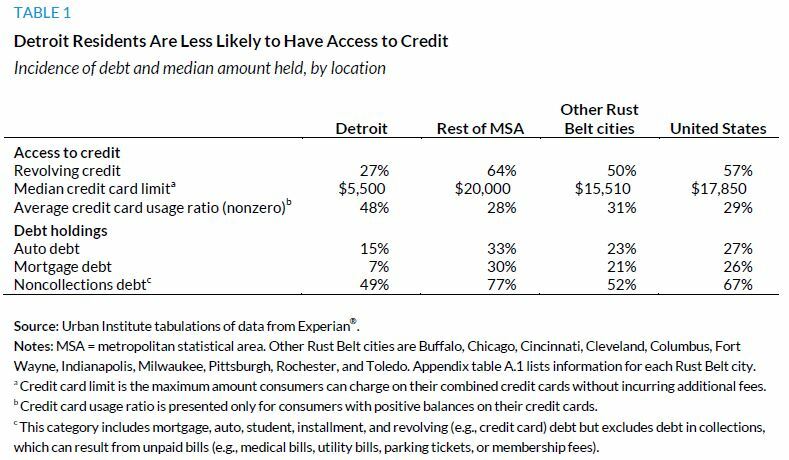 Twenty-seven percent of Detroit residents have revolving credit, primarily credit cards (table 1). The median spending limit for Detroit residents with credit cards is $5,500, and the average amount of credit used (or the credit card usage ratio) is 48 percent, compared with 29 percent nationwide. Using more than 30 percent of available credit can harm credit scores and may reflect financial distress,5 so Detroit residents’ high usage could reflect both credit needs and difficulties. Nevertheless, access to credit is more limited in Detroit than in other areas. Detroit residents are less likely to have credit cards, other revolving credit, or auto or mortgage debt. Residents’ credit card limits are lower, and their credit card usage ratio is higher. The low amount of available credit and the high use of it among Detroit residents may reflect financial stress and a lack of access to credit. Having healthy credit indicates that people have access to credit and are able to pay their bills on time. 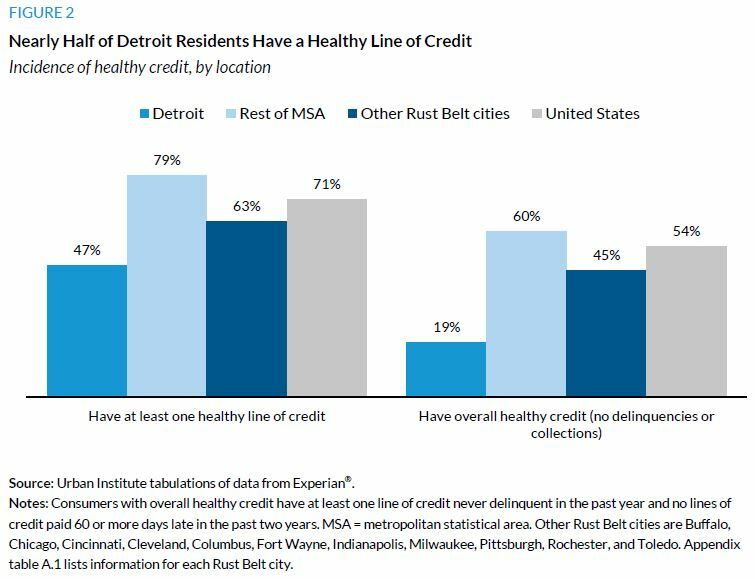 Nearly half (47 percent) of Detroit residents have at least one healthy line of credit, offering hope for a financial future.8 However, just 19 percent of Detroit residents have overall healthy credit.9 This is low compared with other areas (figure 2). Detroit residents may be on top of some of their finances, but most have a ways to go before achieving credit health. The credit industry often interprets delinquent debt—debt and bills past due or in collections—as a sign of financial stress (CFPB 2014).10 By paying bills and loans on time, people are able to gain access to credit and take on debt—including debt that helps them build wealth and invest for the future—without straining their finances or harming their credit score. Roughly one in 12 (8 percent) Detroit residents have debt that is between 60 and 180 days past due (table 2). This past due debt can result from unpaid credit cards, student loans, automobile loans, and other installment loans. Once this debt is more than 180 days past due, it enters collections. Collections debt can also result from unpaid bills such as medical bills, utility bills, parking tickets, and membership fees that are reported to the credit bureau. 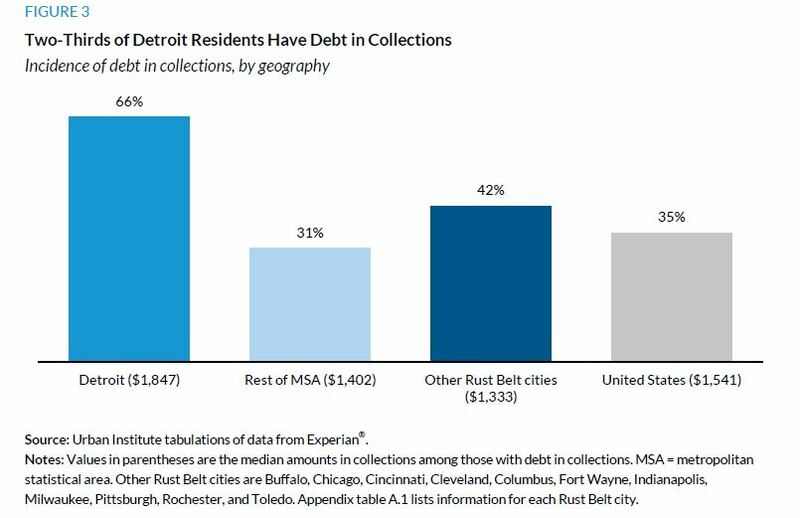 Two-thirds of Detroit residents (66 percent) have debt in collections, double that of the rest of the MSA. The median amount in collections in Detroit ($1,847) is over $400 more than the median in the rest of the MSA ($1,402, figure 3). Thirty-two percent of Detroit residents have medical debt in collections, and 13 percent have government debt in collections (table 2). Medical debt is less indicative of financial stress than other forms of debt in collections because medical debt may result from confusion over bills and payment, more than difficulty paying (CFPB 2014). However, government debt can indicate financial distress if it is tied to bills or fines that could not be paid (e.g., utilities or parking tickets). These government debts unpaid by Detroit residents directly affect the city’s financial health, because the government relies upon these revenues. Only 6 percent of Detroit residents have student loan debt in collections. 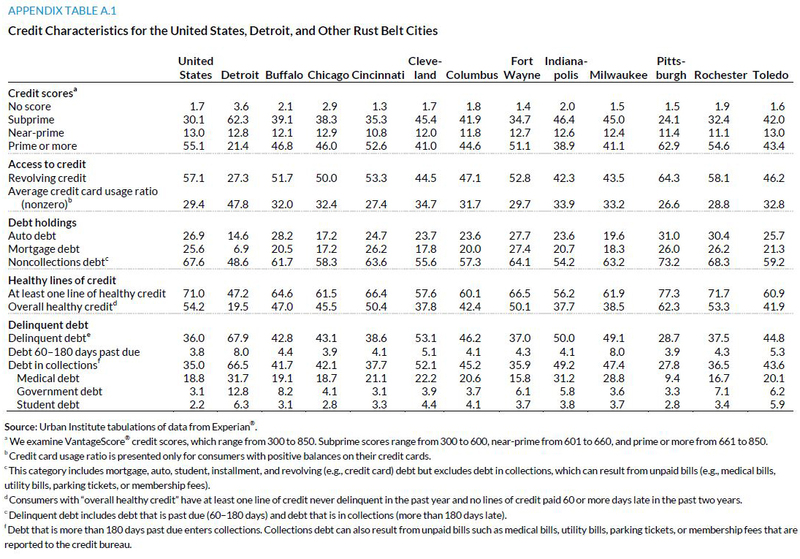 Regardless of debt type, Detroit residents are more likely to have debt in collections than residents of other areas (table 2). Detroit residents’ credit reports show signs of financial distress with low credit scores and high rates of past-due debt and debt in collections. This distress can harm pathways to financial success (CFPB 2014). Credit reports are used to determine access to (and the price of) credit and are sometimes used in hiring, rental, and insurance decisions (CFPB 2012b; Freeborn, Smith, and Vander Nat 2012). Without a history of healthy credit, future borrowing and financial health could be compromised over time. Detroit residents who have low credit scores and diminished financial health would benefit from a range of strategies, from structural interventions to city programs aimed directly at building residents’ financial health to steps individual residents can take. At the structural level, city-led strategies may be important catalysts for improving the long-term financial outlook of Detroit residents. For example, two major workforce development initiatives announced by Detroit’s mayor in 2015 could greatly improve an array of services and resultant job prospects for residents who have struggled to find employment (Coxen et al. 2016). City efforts to change the property tax structure so it lowers the burden on low-income homeowners could reduce delinquencies on such government debt (Blumenthal et al., forthcoming). Additionally, local government and public-private partnerships can be important mechanisms for improving residents’ financial health. Such joint efforts at the local level have helped boost residents’ credit scores and access to the financial mainstream, including financial coaching, integrated service delivery and benefits access, tax preparation services, financial access programs such as Bank On, and small-dollar loans for credit building. For example, under the SaveUSA tax-time savings pilot, low- and moderate-income tax filers were eligible for a 50 percent match on dollars saved for at least one year.11 Results show that even very low income families will save when provided with an incentive and that program increased savings, on average, by $522 (Azurdia and Freedman 2016). With just $250 to $749 in savings, families are less likely to be evicted or to miss a housing or utility payment (McKernan et al. 2016), delinquencies that could lead to negative entries on a credit report. Another program, the Local Interventions for Financial Empowerment through Utility Payments (LIFT-UP), helps families repay their utilities debt and receive financial coaching through the process, building their financial capabilities (Moulton, Harlow, and Kondrajteva 2015). Finally, Detroit residents can take steps to improve their financial health, either with help from local programs or independent of them. Detroit residents could improve their credit reports and potentially their credit scores by routinely checking for inaccuracies; one study estimates that 26 percent of consumers have errors on their reports (Freeborn, Smith, and Vander Nat 2012). Consumers can monitor their credit with free annual reports (CFPB 2012a). Residents’ debt management strategies are also important. For example, paying debt on time is a key factor weighted on a credit report, and keeping credit card usage ratios at 30 percent or less also weighs heavily in credit score calculations.12 Another step residents can take is setting up automatic savings, where money is automatically transferred into a savings account each month. Doing so would allow residents to save each month without additional effort, helping build an emergency savings fund that they can access in times of need rather than accruing debt (McKernan et al. 2016). When coupled with city-level evidence-based policies and programs that have broader impact on financial health, individual behaviors such as establishing liquid savings, paying debt on time, and limiting usage of available credit can put Detroit’s residents on the path toward better financial health. Azurdia, Gilda, and Stephen Freedman. 2016. Encouraging Nonretirement Savings at Tax Time. New York: MDRC. Bai, Bing, Laurie Goodman, Karan Kaul, Maia Woluchem, and Alyssa Webb. 2016. Detroit Housing Tracker, Q1 2016. Washington, DC: Urban Institute. Blumenthal, Pam, Laurie Goodman, Bing Bai, James Gastner, Rolf Pendall, and Sameera Fazili. Forthcoming. The Detroit Housing Market: A Landscape of the Challenges and Innovations. Washington, DC: Urban Institute. CFPB (Consumer Financial Protection Bureau). 2012a. Analysis of Differences between Consumer- and Creditor-Purchased Credit Scores. Washington, DC: CFPB. ———. 2012b. Key Dimensions and Processes in the U.S. Credit Reporting System: A Review of How the Nation’s Largest Credit Bureaus Manage Consumer Data. Washington, DC: CFPB. ———. 2014. Consumer Credit Reports: A Study of Medical and Non-Medical Collections. Washington, DC: CFPB. ———. 2015. Measuring Financial Well-Being: A Guide to Using the CFPB Financial Well-Being Scale. Washington, DC: CFPB. Coxen, Tammy, Jordan Falby, Jeannine La Prad, Taryn MacFarlane, Nicole Sherard-Freeman, and Megan Elyse Williams. 2016. Detroit’s Untapped Talent: Partnerships and Pathways to Success: CSW Workforce System Mapping Report: Part II. Ann Arbor, MI: Corporation for a Skilled Workforce. Freeborn, Beth A., Loren Smith, and Peter Vander Nat. 2012. Report to Congress under Section 319 of the Fair and Accurate Credit Transactions Act of 2003. Washington, DC: Federal Trade Commission. HUD (US Department of Housing and Urban Development) and Treasury (US Department of the Treasury). 2013. “Spotlight on the Housing Market in the Detroit-Warren-Livonia, Michigan MSA.” Washington, DC: HUD and Treasury. Mallach, Alan, and Lavea Brachman. 2013. “Regenerating America’s Legacy Cities.” Cambridge, MA: Lincoln Institute of Land Policy. McKernan, Signe-Mary, Caroline Ratcliffe, Breno Braga, and Emma Cancian Kalish. 2016. “Thriving Residents, Thriving Cities: Family Financial Security Matters for Cities.” Washington, DC: Urban Institute. Moulton, Stephanie, Danielle Harlow, and Olga Kondrajteva. 2015. “Process Evaluation and Interim Outcome Evaluation for LIFT-UP.” Madison: Center for Financial Security, University of Wisconsin–Madison. Parker, Sarah, Nancy Castillo, Thea Garon, and Rob Levy. 2016. “Eight Ways to Measure Financial Health.” Chicago: Center for Financial Services Innovation. Theodos, Brett, Margaret Simms, Mark Treskon, Christina Plerhoples Stacy, Rachel Brash, Dina Emam, Rebecca Daniels, and Juan Collazos. 2015. An Evaluation of the Impacts and Implementation Approaches of Financial Coaching Programs. Washington, DC: Urban Institute. Turbeville, Wallace C. 2013. “The Detroit Bankruptcy.” New York: Demos. Diana Elliott is a senior research associate in the Center on Labor, Human Services, and Population at the Urban Institute, where she studies families’ financial security, economic mobility, and asset building and debt. She was previously research manager of the Pew Charitable Trusts’ work on financial security and economic mobility, where she was instrumental in fielding a major national survey on American family finances, and publishing numerous reports and briefs about the state of financial well-being and economic mobility in the United States. Before joining Pew, Elliott was a family demographer in the fertility and family statistics branch in the Social, Economic, and Housing Statistics Division at the US Census Bureau. She has an extensive background in survey and qualitative research methods. She has been interviewed and quoted by numerous major print, radio, and television outlets, including the Washington Post, AP, Forbes, Bloomberg, NPR, and MSNBC. Elliott holds a PhD in sociology from the University of Maryland, College Park. Caroline Ratcliffe is a senior fellow and economist in the Center on Labor, Human Services, and Population at the Urban Institute. An expert on asset building and poverty, she has published and spoken extensively on poverty, the role of emergency savings, consumer use of alternative financial sector products, and welfare programs and policies. Ratcliffe has evaluated programs aimed at moving low-income families into the financial mainstream and has studied how welfare programs and policies affect families’ economic well-being. Her research also examines persistent childhood poverty and how it relates to adult success. Her work has been cited in elite media outlets, including the Economist, New York Times, Washington Post, and Wall Street Journal, and she has appeared on C-SPAN, Al Jazeera America, NPR, and Marketplace. Before joining Urban, Ratcliffe held positions at the Congressional Budget Office and Brookings Institution. She was also a visiting associate professor at Georgetown University. Ratcliffe holds a PhD in economics from Cornell University. Emma Kalish is a research associate in the Center on Labor, Human Services, and Population at the Urban Institute, where her research interests include poverty and child welfare. She graduated from Macalester College with a degree in economics and urban studies. This brief was funded by a grant from JPMorgan Chase. We are grateful to them and to all our funders, who make it possible for Urban to advance its mission. We thank Bing Bai, Don Baylor, Pamela Blumenthal, Janis Bowdler, Colleen Briggs, Liza Getsinger, Signe-Mary McKernan, Erika Poethig, and Ellen Seidman for helpful suggestions. We are also grateful to Fiona Blackshaw and David Hinson for excellent writing support.